a. 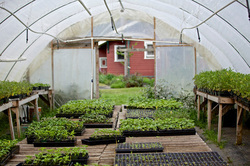 To permanently preserve land for locally owned and managed farms, and market and community gardens. b. To provide opportunities for farmers, with special consideration to those of low income, to lease agricultural land at affordable rates, on a long term basis. c. To provide opportunities for peoples, with special consideration to low income peoples, to secure housing on a long term basis, that is decent and affordable. (5) educating the larger community about agricultural issues and the Community Land Trust model of land stewardship. e. To demonstrate sustainable land use and planning for environmental purposes and resource conservation. f. To protect the natural environment and to promote the ecologically sound use of natural resources and the long term health, safety, and well being of the community. a. The Lessee Members, who shall be all persons who lease land or housing from the Corporation or who lease or own housing that is located on land leased by another entity from the Corporation. b. The Regular Members, who shall be all other persons who have paid membership dues as established by the Membership for the current calendar year. a. Annual membership dues shall be assessed for each calendar year by an affirmative vote of a majority of the Active Members present and voting at the Annual Meeting preceding that year. If no such action is taken to assess dues for a given year, the dues for that year shall be as established for the previous year. 3. Rights of Active Members. a. Every Active Member shall have the right to participate in meetings of the Membership, to cast one vote on all matters properly put before the Membership for consideration, to nominate and participate in the election of the Board of Directors as provided by these Bylaws, to serve on the Board of Directors or on committees if chosen, to receive notices and minutes of Membership Meetings and Annual Reports of the Corporation. b. The approval of the Active Membership, in accordance with these Bylaws, shall be required before action may be taken on the assessment of membership dues, removal of Board Members, the sale of land, the amendment of the Articles of Incorporation or these Bylaws, and the dissolution of the Corporation. a. Notice of Meetings. Written notice of every Membership Meeting shall be given to all Active Members and shall include an agenda for the meeting. Except as otherwise provided in Article IX of these Bylaws, notice shall be mailed (or emailed) at least seven days prior to a meeting, making an effort to give at least 14 days written notice. b. Annual Meetings. The Annual Meeting of the Membership, for reports to the Membership by the Board of Directors and Officers, the election of Directors, the assessment of dues, and the transaction of other business, shall be held within the first four months of each year. The location and specific time of the Annual Meeting shall be determined by the Board of Directors. Notice of the Annual Meeting shall include a list of those persons nominated for the Board of Directors as provided in Article III of these Bylaws. c. Regular Meetings. Regular Meetings may be scheduled by the Active Membership at the Annual Meeting. d. Special Meetings. Special Membership Meetings shall be called by the Board of Directors or by a written petition, addressed to the Chair of the Corporation, signed by at least one tenth (10%) of the Active Membership. At a Special Meeting, only those matters stated on the agenda, as included in the notice of the meeting, may be acted upon by the Membership. e. Open Meetings. All Membership Meetings shall be open to any person. f. Minutes. Minutes of all Membership Meetings shall be recorded by the Clerk of the Corporation or by another person designated by the Board of Directors. g. Quorum. A quorum shall consist of those voting members present. h. Decision-Making. Decision Making Policies adopted by the Board shall be used as a guide to achieving consensus. Whenever possible, decisions shall be made at Membership Meetings by consensus of the Active Members present, a quorum being assembled. In the event that consensus is not attained, a decision shall be made by an affirmative vote of a majority of the Active Members present and voting, a quorum being assembled, except as otherwise provided in these Bylaws. Before a vote is held on any motion, the exact language of the motion shall be recorded by the Clerk and read to the Membership and all Members present shall have a reasonable opportunity to express their opinions on the proposition. 1. Number of Directors. Except for the initial Board named in the Articles of Incorporation, the Board of Directors shall consist of no less than 7 or more than 15 Directors. 2. Composition of the Board. There shall be three categories of Directors, each with representation as close to one third of the total Board as possible. Three categories shall be “Lessee Representatives,” representing Lessee Members, “Member Representatives,” representing Regular Members, and “Public Representatives,” representing the interests of the general public. It shall be the goal of this corporation that one third of its Board of Directors be representative of low income interests. (1) Lessee Members may nominate Lessee Representatives to the Board from among themselves. These nominations must be submitted in writing to the Clerk of the Corporation at least seven days prior to the Annual Meeting of the Membership. (2) In the event there are no or too few Lessee Members, Regular Members who are prospective future lessees may apply or submit nominations for “Lessee Representatives.” . (3) Except as provided in this paragraph and in paragraph (2) above, Regular Members may not nominate candidates for Lessee Representatives. (1) Regular Members may apply or nominate Member Representatives to the Board from among themselves. These applications or nominations must be submitted in writing to the Clerk of the Corporation at least seven days prior to the Annual Meeting. (2) Unless there are an insufficient number of candidates for the Member Representative positions, Lessee Members may not nominate candidates for Member Representatives. c. Public Representatives. At least seven days prior to the Annual Meeting, the Board of Directors shall make nominations for Public Representatives to the Board. In making such nominations, the Board shall endeavor to identify willing candidates who are associated with other nonprofit organizations or public agencies concerned with land conservation, agriculture, and housing issues in the region, or who are associated with the Community Land Trust movement, or who for other reasons, are in a position to help the Corporation to function effectively in the larger community. d. Notice of Nominations. A list of all persons nominated in each of the three categories shall be included with the notice of the Annual Meeting. a. The Board will prepare a slate of candidates from among applications and nominations received at least seven days prior to the Annual Meeting. b. Each Active Member may vote for one nominee for each vacant position in each of the three categories of Board Representatives. c. Positions shall be filled by those candidates receiving the largest number of votes, though such numbers may constitute less than a majority of the total votes cast. d. After election of Directors to the Board at the Annual Meeting, Board members will be canvassed as to their eligibility to act as representatives of low income interests. If it is determined that less than 1/3 of the Board can be so characterized, then the Board will appoint sufficient additional qualifying Directors. b. Qualifications of Replacements. Any person elected to fill a vacancy on the Board of Directors must be one who can be reasonably expected to represent the interests of the constituents in the category (Lessee, Member, or Public) in which the vacancy occurs. c. Term of Replacements. Replacement Directors elected by the Board shall serve until the next Annual Meeting of the Membership, at which time the position shall be filled by a person elected, according to the procedures described in Sections 3 and 4 of this Article, to serve out the remaining term of the person who has vacated the position, or, in the event such term has expired, to serve a full term. a. Terms of Directors. Except as otherwise provided in these Bylaws, each director shall serve a full term of three years. c. Commencement of Terms. The term of office of a regularly elected Director shall commence at the adjournment of the Annual Membership Meeting in which he or she is elected. The term of office of a Director elected by the Board to fill a vacancy shall begin at the time of his or her acceptance of the position. a. Any Director may resign at any time by giving written notice to the Chair. Unless otherwise specified, such resignation shall be effective upon the receipt of notice by the Chair. b. A Director shall be considered to have given notice of resignation and his or her position shall be declared vacated by the Board of Directors if he or she fails to attend three consecutive meetings of the Board with the exception of emergency meetings, unless good cause for absence and continuing interest in participation on the Board are recognized by the Board. When a Director has failed to attend three consecutive meetings, the Chair shall notify him or her in writing that, at the next regular Board meeting, his or her position will be declared vacant unless the Board determines that there has been good cause for the Director’s absences and that the Director continues to be interested in participating on the Board of Directors. The notification by the Chair shall be mailed no later than seven days prior to the Board meeting at which the position may be declared vacant. At this meeting, the Director in question shall be given the opportunity to show good cause for absence from meetings and continuing interest in participating on the Board. The resignation of a Director who has missed three consecutive meetings shall not become effective until the Board has declared the position vacant as provided herein. 8. Removal of Directors. A Director of the Corporation may be removed for good cause by the Active Members of the Corporation when such Director is judged to have acted in a manner seriously detrimental to the Corporation. However, before such removal can occur, the following procedure must be followed. a. An attempt has been made to resolve the issues using conflict resolution procedures as adopted by the Board, if appropriate. b. Written charges specifying the conduct considered to be detrimental must be signed by at least ten members of the Corporation and submitted to the Chair (or, if the Chair is the Director charged, to the Vice Chair). Any Active Members of the Corporation may submit such charges. c. The Chair (or Vice Chair) shall deliver or mail a copy of the charges to the Director charged. d. A Special Committee consisting of three Active Members of the Corporation shall be created to consider the charges. One member of the Committee shall be selected by the Board of Directors, but without the participation of the Director charged, within ten days following the delivery or mailing of the charges to the Director charged. In making its selection, the Board shall endeavor to select a person who will consider the charges without bias. No later than ten days following the Board’s selection of the first member of the Committee, a second member may be selected by the Director charged. In the event that the Director charged fails to select a second member of the Committee within ten days, the Board may select a second member who, in the judgment of the Board, will consider the charges without bias. Within ten days following the selection of the second member of the Committee, the first and second members shall select a third member of the Committee. If the first and second members cannot agree upon a third member within this ten-day period, the Board shall select a third member. e. The Special Committee shall hold a hearing, at which both the Director charged and the members who have filed charges may present evidence in the presence of the other. Following the hearing, the Committee shall prepare a written report of its findings and its recommendation for or against removal. The recommendation shall be based on a majority vote if consensus cannot be reached. The report shall contain a statement of how each member of the Committee has voted. The report shall be completed and submitted to the Chair of the Corporation no later than one month following the selection of the third member of the Committee. f. If the Committee recommends removal of the Director, the recommendation shall be presented to the Active Membership, which shall then have sole authority to decide the question of removal. A Membership meeting for this purpose shall be called by the Chair for a time no later than one month following the Chair’s receipt of the Committee’s recommendation for removal. Notice of this meeting shall include a complete copy of the Committee’s report. 9. Meetings of the Board of Directors. a. Notice of Meetings. Except as provided below for emergency meetings, written notice of a Board meeting shall be mailed to all Directors at least seven days prior to the meeting or shall be delivered in person at least five days prior to the meeting. b. Waiver of Notice. Any Director may request waiver of written notice of Regular Meetings required by these Bylaws. c. Annual Meeting. The Annual Meeting of the Board of Directors may be held immediately following the Annual Membership Meeting and must be held no later than one month following the Annual Membership Meeting. d. Regular Meetings. The Board of Directors shall meet no less often than once every two months, at such times and places as the Board may establish. e. Special Meetings and Emergency Meetings. Special meetings may be called by the President, by any three Directors, or by 10% of the Active Members of the Corporation. Notice must be given as provided above, unless any three Directors determine that the matter at hand constitutes an emergency. When so determined, an Emergency Meeting may be called on one-day notice. Notice of Emergency Meetings, including an announcement of the agenda, shall be given by telephone or in person to all Directors. At any special or Emergency Meeting of the Board, only those matters included in the announced agenda may be acted upon unless all of the Directors are present at the meeting and unanimously agree to take action on other matters. 10. Procedures for Meetings of the Board of Directors. a. Open Meetings. All meetings of the Board of Directors shall be open to any person except when the Board has voted, during an open meeting, to go into executive session. (1) Contracts, labor relations agreements with employees, arbitration, grievances, or litigation involving the Corporation when premature public knowledge would place the Corporation or person involved at a substantial disadvantage. (2) Real estate purchase offers and the negotiating or securing of real estate purchase options or contracts. (3) The appointment or evaluation of an employee, and any disciplinary or dismissal action against an employee (however, nothing in this section shall be construed to impair the right of the employee to a public hearing if action is taken to discipline or dismiss). (4) The consideration of applications from persons seeking to lease land and/or housing, purchase housing, or arrange financing from the Corporation. (5) Relationships between the Corporation and any party who might be harmed by public discussion of matters relating to the relationship. c. Quorum. At any meeting of the Board, a quorum shall consist of a majority of the Board Members, provided that at least one representative from each of the three categories is present. d. Decision-Making. Decision Making Policies adopted by the Board shall be used as a guide to achieving consensus. The Board shall attempt to reach consensus on all decisions. In the event that consensus cannot be achieved, a decision may be made by a majority of the Directors present and voting, except as otherwise provided in these Bylaws. e. Minutes. Minutes of all Board Meetings shall be recorded by the Clerk or by such other persons as the Board may designate, and shall be approved by the Board at the next Board meeting. All minutes of Board meetings shall be kept on permanent record by the Corporation and shall be open for inspection by any Member of the Corporation. a. Approve a written Annual Report to The Membership, and make this report available to all members. This report shall include a summary of the Corporation’s activities during the previous year, the Corporation’s most recent financial reports, and a list of all real estate held by the Corporation. c. Select all officers of the Corporation. d. Supervise the activities of all officers, agents, and committees of the Corporation in the performance of the assigned duties and investigate any possible conflicts of interest within the Corporation. e. Adopt and implement personnel policies providing for the hiring, supervision, and evaluation of employees. f. Provide for the deposit of funds in accordance with Article X of these Bylaws. g. Determine by whom and in what manner deeds, leases, contracts, checks, drafts, endorsements, notes and other instruments shall be signed on the behalf of the Corporation. h. Acquire such parcels of land, with or without buildings and other improvements, through donation, purchase, or otherwise, as the Board shall determine that it is useful and prudent to acquire in furtherance of the purposes of the Corporation. i. Convey the right to use land, through leases or other limited conveyances, in accordance with the provisions of Articles V, VI and VII of these Bylaws. j. Convey ownership of housing and other improvements on the Corporation’s land to qualified lessees, as possible, in accordance with the provisions of Articles V, VI and VII of these Bylaws. k. Provide for the purchase of housing and other improvements on the Corporation’s land from lessees who wish to sell or whose leases are terminated, at prices based on the “resale formula,” in accordance with Article VII of these Bylaws. l. Develop the resources necessary for the operation of the Corporation and for the acquisition and development of land and housing. m. Assure the sound management of the Corporation’s finances. a. Appoint and discharge advisors and consultants. b. Create such committees as are necessary or desirable to further the purposes of the Corporation. Any member of the Corporation may be appointed to any committee. No committee may take action on behalf of the Corporation except as authorized by the Board of Directors. c. Call special meetings of the membership. d. Approve the borrowing and lending of money as necessary to further the purposes of the Corporation and in accordance with Article X, Paragraph 4 of these Bylaws. e. Exercise all other powers necessary to conduct the affairs and further the purposes of the Corporation in accordance with the Articles of Incorporation and these Bylaws. 13. Limitation on the Powers of the Board of Directors. Action taken by the Board of Directors on any motion for the assessment of membership dues, the removal of Directors, the sale of land, the establishment or alteration of the “resale formula,” the amendment of the Certificate of Incorporation shall be approved by the Active Membership in accordance with these Bylaws. 14. Conflict of Interest. No member of the Board of Directors shall vote on any matter in which such Director or any parent, spouse, child, partner, employer or similar related business entity has a substantial interest in any property or business that would be substantially affected by such action. 1. Designation. The officers of the Corporation shall be: Chair (also known as President), Vice-Chair (or two Co-Chair may substitute these two positions), Clerk, and Treasurer. The Offices of Chair and Treasurer may not be simultaneously held by the same Director. 2. Election. The officers of the Corporation shall be elected by a majority vote of the Board of Directors, from among themselves, at the Annual Meeting of the Board. Any vacancies occurring in any of these offices shall be filled by the Board for the unexpired term. 3. Tenure. The officers shall hold office until the next Annual Meeting of the Board after their election, unless before such time, they resign or are removed from their offices, or unless they resign or are removed from the Board of Directors. Any officer who ceases to be a member of the Board of Directors shall thereby cease to be an officer. 4. Removal from Office. The officers shall serve at the pleasure of the Board of Directors and may be removed from office at any time by an affirmative vote of two-thirds of the entire Board of Directors. a. Preside at all meetings of the Board of Directors and the Membership when able to do so. b. Consult with the other officers and the committees of the Corporation regarding the fulfillment of their duties. c. Assure that an agenda is prepared for every meeting of the Membership and the Board of Directors. d. Give notice to any Director who has been absent from three consecutive regular meetings, as required by these Bylaws. e. Call special meetings of the Membership or Board of Directors when petitioned to do so in accordance with these Bylaws. f. Carry out the duties assigned to the Chair regarding the removal of a Director. g. Perform such other duties as the Board of Directors may assign. a. Perform all duties of the Chair in the event the Chair is absent or unable to perform these duties. b. Perform such other duties as the Board of Directors may assign. a. Assure that a list of all Members and their mailing addresses is maintained by the Corporation. b. Assure that proper notice of all meetings of the Membership and the Board of Directors is given. c. Assure that motions and votes in meetings of the Membership and Board are accurately represented to those present and are accurately recorded in the minutes. d. Assure that minutes of all meetings of the Membership and the Board of Directors are recorded and kept on permanent record. e. Perform such other duties as the Board of Directors may assign. a. Assure that the financial records of the Corporation are maintained in accordance with sound accounting practices. b. Assure that funds of the Corporation are deposited in the name of the Corporation in accordance with these Bylaws. c. Assure that all deeds, title papers, leases, and other documents establishing the Corporation’s interest in property and rights in particular matters are maintained in such manner as the Board directs. d. Assure that all money owed to the Corporation is duly collected and that all gifts of money or property to the Corporation are duly received. e. Assure the proper disbursement of such funds as the Board of Directors may order or authorize to be disbursed. f. Assure that accurate financial reports (including balance sheets and revenue and expense statements) are prepared and presented to the Board at the close of each quarter of each fiscal year. g. Assure that such reports and returns as may be required by various government agencies are prepared and filed in a timely manner. h. Assure that an annual budget is prepared and presented to the Board for its approval prior to the beginning of each fiscal year. 1. Principles of Land Use. The Board of Directors shall oversee the use of land owned by the Corporation and shall convey the right to productive use of the land while preserving its natural resources in perpetuity. In leasing land the Board of Directors will seek to balance the rights and responsibilities of lessees and the larger community with the intent of fostering cultural connections between a healthy, sustainable agriculture and a thriving community. a. The Board will protect to the best of its ability the productive capacity of the land for the benefit of the local community now and in perpetuity. b. The Board will facilitate access to land for farmers who are committed to developing and practicing sustainable farming methods. Sustainable farming practices may be exemplified by: cycling farm nutrients, tracking soil management, revegetation and reforestation, organic growing practices, or restoration of wildlife habitat. c. The Board will facilitate community empowerment and the equitable distribution of resources, which it also recognizes are prerequisites of achieving sustainability. Examples may include: co-operative structures, emphasis on local markets, development of appropriate technology, equitable wage structures, affordable leases, educational and apprenticeship programs, and egalitarian work and living situations. d. The Board will convey land use rights on terms which conserve and replenish natural resources, including air, soil, water, and native plant and animal communities. e. The Board will facilitate access to land for farmers with special concern for those who need is greatest. f. The Board will respect and foster self-determination and community participation in decision making. a. The Board shall consider the needs of potential lessees and shall attempt to effect a just distribution of land use rights. b. The Board shall convey land use rights on terms that will preserve affordable access to land and housing for future residents of the community, with a special consideration to low income people. c. The Board shall convey land use rights in a manner that will promote the long-term well-being of the community and the long-term health of the environment. d. Termination of Leases. The Board shall provide for periodic inspection of all leased lands and shall terminate leases, according to procedures set forth in lease agreements, if necessary for the protection of the land, the surrounding community or future generations. 2. Encumbrance of Land. The decision to mortgage or otherwise encumber land owned by the Corporation shall require the approval of the Board of Directors and written consent of any parties to whom such land is leased, excluding preexisting leases at the time of purchase. c. The approval of two thirds of the Active Members present at two consecutive regular or special Membership Meetings, a quorum being assembled, provided that written notice of such meeting has described the proposed sale and the reasons for the proposal. 1. Ownership of Housing and Improvements on the Corporation’s Land. In accordance with the purposes of the Corporation, the Board of Directors shall take appropriate measures to promote and facilitate the ownership of housing and other improvements on the Corporation’s land by low and moderate income people. These measures may include, but are not limited to, provisions for the sale of housing to such people; provisions for financing the acquisition of housing by such people, including direct loans by the Corporation; and provision for grants and other subsidies that will lower the cost of housing for such people. 2. Purchase by the Corporation of Property Located on the Corporation’s Land. It is a purpose of the Corporation to preserve the affordability of housing and other improvements for low and moderate income people in the future. Accordingly, when land-use rights are leased, the Board of Directors shall assure that, as a condition of lease, the Corporation is granted the right to purchase any lessee-owned housing or other improvements on the land, for a price determined by the “resale formula,” at such time as the lessees wish to sell or the lease is terminated. a. To the extent possible, the formula shall allow the seller to receive a price based on the value that the seller has actually invested in the property being sold. b. To the extent possible, the formula shall limit the price of the property to an amount that will be affordable for other low and moderate income people at the time of the transfer of ownership. 5. Procedure for Altering the Resale Formula. The consistent long-term application of a resale formula is essential to the purposes of the Corporation. Accordingly, the resale formula shall not be altered unless the Board of Directors and Active Members of the Corporation determine that the current formula presents an obstacle to the achievement of the purposes of the Corporation. In such an event, the resale formula may be altered only by a two-thirds vote of the entire Board of Directors and a two thirds vote of the Active Members present at a Membership meeting, as described above for the adoption of the formula. 2. An affirmative vote by two thirds of the Active Members present at any regular or special Membership meeting, a quorum being assembled, provided that written notice of such meeting has set forth the proposed amendment or replacement, with appropriate explanations thereof. 2. An affirmative vote by two thirds of the Active Members present at two consecutive regular or special Membership meetings, a quorum being assembled, provided that written notice of such meeting, including a full description of the proposed plan of dissolution, has been given to all Members of the Corporation no later than three weeks prior to the meetings. 1. Fiscal Year. The fiscal year of the Corporation shall begin on January 1 of each year, and shall end on December 31 of each year. 2. Deposit of Funds. All funds of the Corporation not otherwise employed shall be deposited in such banks, trust companies, or other reliable depositories as the Board of Directors from time to time may determine. 3. Checks, etc. All checks, drafts, endorsements, notes and evidences of indebtedness of the Corporation shall be signed by such officers or agents of the Corporation and in such manner as the Board of Directors from time to time may determine. Endorsements for deposits to the credit of the Corporation shall be made in such manner as the Board of Directors from time to time may determine. 4. Loans. No loans or advances shall be contracted on behalf of the Corporation, and no note or other evidence of indebtedness shall be issued in its name, except as authorized by the Board of Directors. Any such authorization shall relate to specific transactions. 5. Contracts. Any officer or agent of the Corporation specifically authorized by the Board of Directors may, on behalf of the Corporation, enter into those contracts or execute and deliver those instruments that are specifically authorized by the Board of Directors. Without the express and specific authorization of the Board of Directors, no officer or other agent of the Corporation may enter into any contract or execute and deliver any instrument in the name of the Corporation. 6. Indemnification. Any person (and the heirs, executors and administrators of such person) made or threatened to be made a party to any action, suit or proceeding by reason of the fact that he or she is or was a Director or Officer of the Corporation shall be indemnified by the Corporation against any and all liability and the reasonable expenses, including attorney fees and disbursements, incurred by him or her (or his or her heirs, executors, or administrators) in connection with the defense or settlement of such action, suit, or proceeding, or in connection with any appearance therein, except in relation to matters as to which it shall be adjudged in such action, suit or proceeding that such Director or Officer is liable for negligence or misconduct in the performance of his or her duties. 7. Diversity, Equity, Inclusion: South of the Sound Community Farm Land Trust is a corporation fully committed to diversity, equity, and inclusion in principle and in practice. These values shall be codified in a Diversity, Equity and Inclusion policy adopted and periodically updated by the Board of Directors. 1. Initial Membership. The Initial Members empowered to vote at the first annual meeting shall be those persons who have attended at least one of the organizational meetings held between March 1, 1996 and the time of the First Annual Meeting, as recorded in the minutes of these meetings. 2. Initial Board of Directors. The Initial Board of Directors shall be as stated in the Certificate of Incorporation. The Initial Board, after approving these Bylaws, shall call the first Annual Meeting of the Membership, and shall serve until the first elected Board of Directors has been seated upon the completion of the First Annual Meeting. b. Ratification by two thirds of the Initial Members present and voting at the First Annual Meeting. 4. Nomination of Directors to By Elected at First Annual Meeting. In consultation with the Initial Members, the Initial Board of Directors shall nominate a slate of twelve candidates, and shall designate four of these candidates as candidates for “Lessee Representatives,” four as candidates for “General Representatives,” and four as candidates for “Public Representatives.” Additional nominations for any of the three categories of representatives may be made by any Initial Member from the floor at the First Annual Meeting. 5. First Annual Meeting. The First Annual Meeting of the Membership, for the ratification of these Bylaws, the election of Directors, the assessment of membership dues, and the transaction of other business, shall be held in 1998. The location and specific time of the First Annual Meeting shall be determined by the Initial Board of Directors. Notice of the First Annual Meeting shall be mailed to all Initial Members at least seven days prior to the Meeting end shall include a list of those persons nominated for the Board of Directors in accordance with Paragraph 3 above. Except as otherwise provided in this Article, the election of Directors and other business of the First Annual Meeting shall be conducted in accordance with Articles II and III of these Bylaws.